Williams (Bohemian Grove, 2013), in the second installment of her conspiracy thriller trilogy, offers a familiar story of aliens and cover-ups. Carter Robinson is a young woman who’s not fully human. She’s a descendant of an alien race called the Anunnaki, who hail from the legendary planet Nibiru. For centuries, a powerful, ruthless organization known as the Vaticates has hidden the Anunnaki’s existence. They seek to defend the global religious establishment, which could be irrevocably shattered if the Anunnaki and their role in human history became known to the public. Carter is now the last connection between humanity and the Anunnaki, and so the Vaticates seek to destroy her at any cost. To forestall this, and help free mankind from the scourge of the Vaticates’ power, Carter undertakes a dangerous global journey across the United States to Machu Picchu, Peru, and on to Egypt. 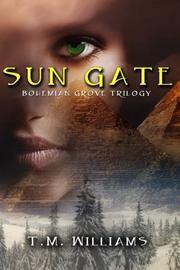 She’s aided in her journey by two men, Jack and William, as she risks her life to reach the Sun Gate—an interdimensional communication link that she can use to contact the Anunnaki. The novel is generally entertaining, if somewhat insubstantial, and has strong overtones of both New-Age ideas and conspiracy theories. The style is reminiscent of globe-trotting best-sellers of the 1970s, but the prose is occasionally unpolished or florid (“She felt the anger rolling off him and seeping into her pores”). However, the storytelling is clear and well-paced, and it delivers a story about “real-world” paranormal phenomena in a manner that casual readers may find believable enough. Some readers may be troubled by the novel’s internal cosmology, due to its use of “Vaticates” for its evil conspiracy; on the other hand, a vast number of existing conspiracy thrillers have already pressed religious organizations into villainous service, and this book likely won’t be the last. A lightweight but competent sci-fi thriller.